Hello my friends. 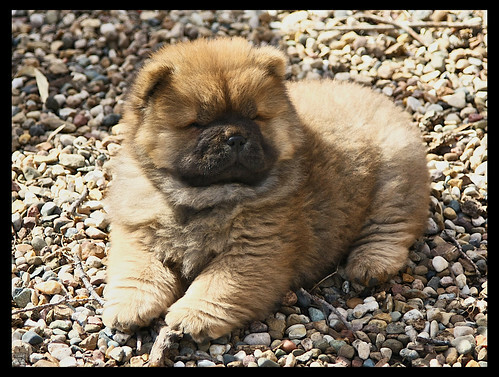 1000 apologies for the disappearing act last week but I was called away at the last minute to the midwest for family matters and while I was visiting Minnesota, made a side trip to my BFF in Iowa to see her 8 week old litter of beautiful chow puppies. I have a gazillion gorgeous photos I took at Dianas house and will send them soon but had to share these few of awesome baby “GRACIE”. 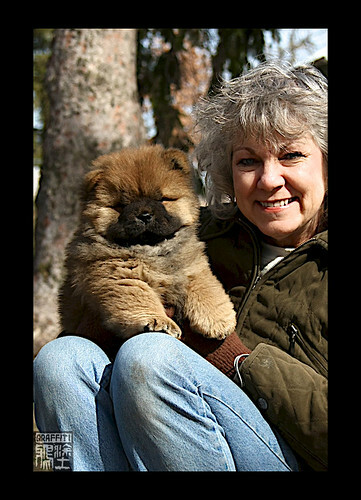 The human and chow smiles say it all. I was lured to “Camp Hillygus” and the bait was too cute to resist!! LOL! Diana you are getting really good with my camera because it was hard to choose which shot of the two of us I liked the best…….kind of the problem of the week…….making choices with so much WONDERFUL everywhere I turned !!! My brain was so fried the last day I couldn’t even make a decision about the appetizer to order at the airport on the return trip home . We won’t be breeding again but will show Gracie to her championship..I will try to do it myself and Steve will help when I can’t. I have an arrangement with Diana in the event she would like to let her have babies to continue the lines. Diana and I have both worked with the same lines since the start. She is one of a handful of incredible friends who have carried on with these pedigrees even after we stopped being active in breeding dogs. I have pix of another very special litter I hope a friend will let me share soon too! GRIN!! 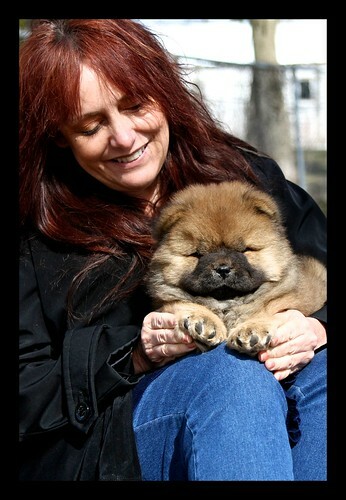 And check out the photo of our Magenta at 4 months below……….how could I not bring Gracie home? No one will ever replace Magenta nor would I want them to, but Gracie already has wormed her way into a place in my heart that had been feeling VERY empty for far too long . I stubbornly resisted letting another dog try to fill that painful void until now. Gracie came into our lives as unexpectedly as Magenta left us. It was just meant to be I am certain!!! More photos to come this week and video too. 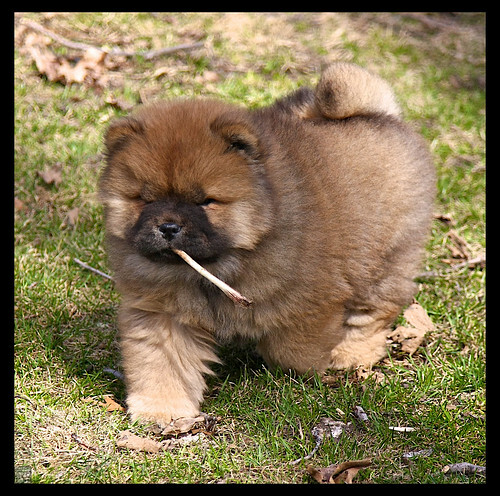 You will have to pardon the obnoxious new puppy mom photos in advance……..Gracie will Grace more blog posts than the pandas I guarantee!! They are babies for such a short time and I want to record every single moment. 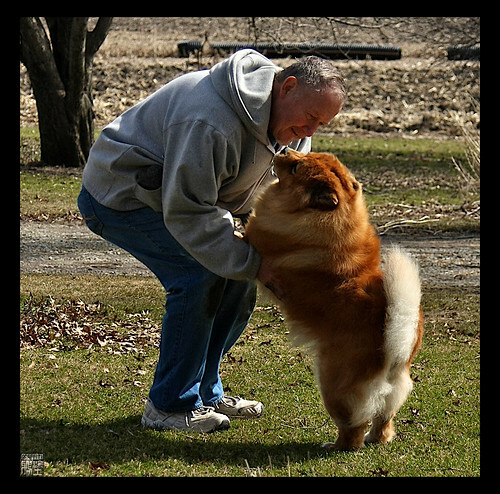 Does this just make you want to cry….I love the old dogs sooooooo much!! I’m catching up on email now. I had some issues with AT & T in Iowa with the iphone so had to quit checking emails for fear of the dreaded “roaming bill”. If you wrote with anything important and I do not answer by tomorrow evening, please resend in case I missed your email. More to come soon!!!!! 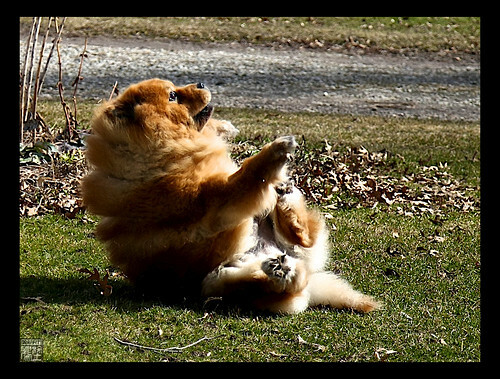 Sandy~so glad Gracie went home with you. She is so sweet! Now come back here for a show. It was great to see you again. Will look forward to watching her grow up. Will she be on the webcam? And above all don’t forget she is a PANTHER FAN!!!!!!!!!!!!!!! She is lovely , Sandra ! Congratulations on your new baby !!! It is so exciting, isn´t it ????? Congrats on your new sweetheart! She is gorgeous. Gracie is a precious addition to your family. 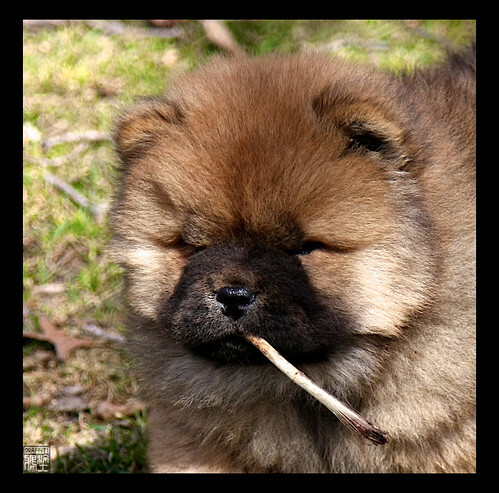 A huge MAZEL TOV on your new fluffy baby!!! Gracie is such a cutie 🙂 How is she getting along with her sisters? Richard and I wish you and Steve many happy years with your new puppy. OMG OMG…… how totally adorable!!! Gracie is the cutest pup. I want to squish her. I am so happy for you. I want to see more pics and videos!! Oh Sandra, you don’t even know the smile and tears of joy you have just put upon my face. I have really been feeling down this week. I finally get a new puppy to show and NOBODY is showing right now. Can’t wait to meet your lil darling. Hi Sandy: She’s gorgeous. No wonder you told me you had lots to talk about when you got home. We will have to plan on going to shows together. I can’t wait to meet her. I’m so happy for you. 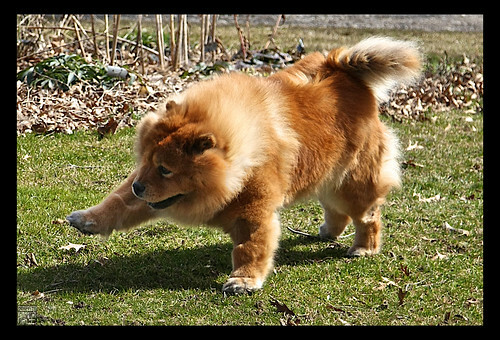 It’s about time you got another chow, Sandra! But, if you were waiting for the right one, then I think the loooooonnnng wait was worth it for this little girl! She is adorable. ooooooooo……..absolutely darling!!!!! it will be so much fun to watch her grow up. you are gonna be one busy mom……..so glad you got a new baby….they really put “new life” into a home!! have the “girls” seen her yet??? KNOW ARE HEARTS OF LOVE AN THEY CAN FEEL IT AS MUCH AS WE DO , IF NOT MORE. HAVE FUN. HAVE FUN WITH ALL THOSE PUPPY KISSES AUDREY SAYS. Sandy, I am SO happy for you and Steve! And so happy for Diana, too, because I know she must be just thrilled to have her BFF back in the show ring with one of her babies. Gracie is gorgeous! Thanks for the pics of her AND of Nicki. Love those! OMG Thank you all so very very much for your sweet congratulations and kudos about Mz. Gracie. She sends you special purple smooches and sweet puppy breath. Wow I can’t believe how much I have missed that puppy breath for the past 7 years! What a beautiful thing to see all these comments from you all!!! 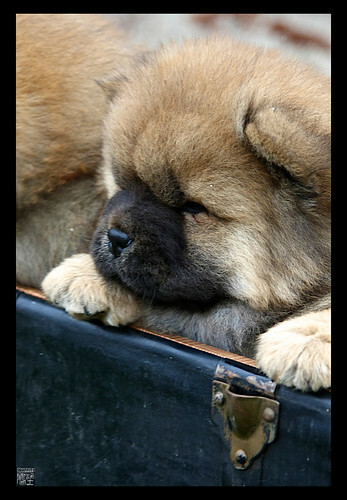 If anyone knows how much I love my dogs and adore having puppies around it’s my blog readers. To be able to share Gracie and all my critters with my friends is so much fun!!!! A big puppy group hug!!!! OMG!!!!! I could hug her to pieces. Congratulations on your gorgeous new baby Gracie! 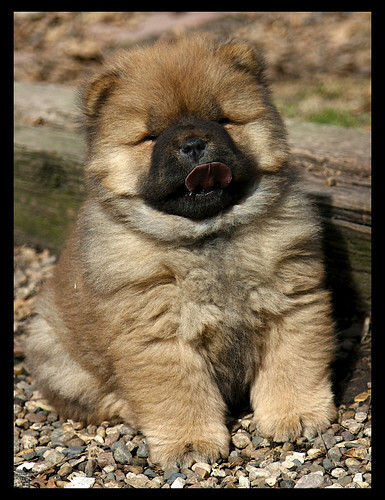 I always say, there is nothing on this earth that can compare to a Chow puppy. I wish you many years of healthy happiness and joy with your new little one.